It takes 3 days to make each batch...a genuine Slow Food! The cycle of our preserves making begins each year with our organic marmalades. We continue to make them the same way we have for the last 20 some years...using organically grown fruit, carefully removing all the peel while leaving the white pith that is then trimmed away leaving just the luscious citrus to be hand-cut, mixed with the peel, filtered water, and cane sugar. WOW! The laborious process takes three days until the flavor-packed mixture, with full pieces of citrus in every bite is set, using no commercial pectin…a 'slow' but rewarding journey! 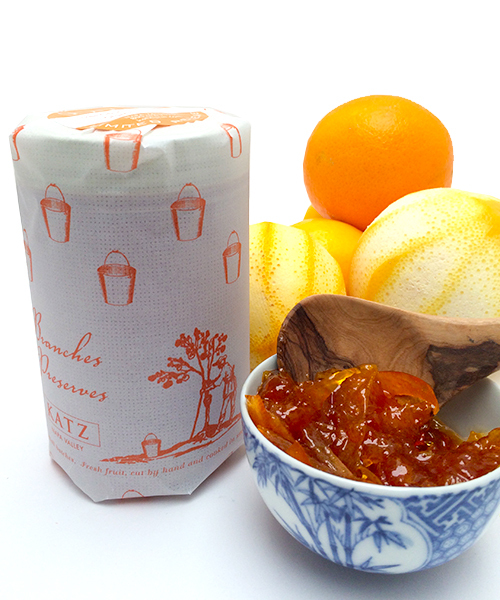 Our Three Citrus Marmalade is made from all organic Navel oranges, Meyer lemons and Ruby grapefruits. It is chock full of bright, intense, and rich citrus flavor...great smeared on whole grain toast or freshly baked muffins, or served as a condiment with roasted pork loin and wintergreens. Click below for photos of the Three Citrus Marmalade being made by hand in our kitchen! Making our fresh fruit preserves in the artisanal manner for the past 20 or so years has been a true labor of love. Each new season brings the excited anticipation of visiting our farmer friends to see them once again and share in the bounty of their well-tended orchards and fields. In our Napa kitchen, each batch of fruit is skillfully cut or sorted by hand, simmered in small, open kettles, using the smallest amount of sugar and fresh lemon juice needed to set...no pectin, no preservatives, no tricks!